This is a well-loved Whitman Pillow Book from 1967 illustrated by two of my favorites; Bonnie and Bill Rutherford. It's completely disbound and held together with brittle tape, but I'll make the most of it here. 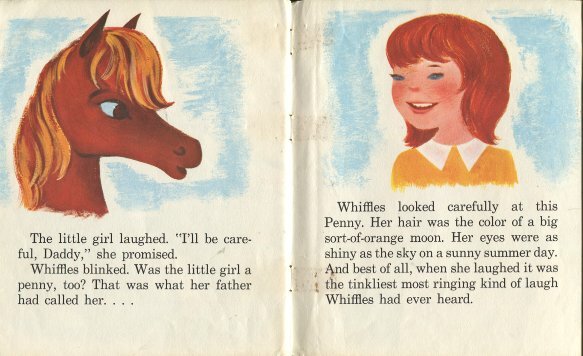 Whiffles was a small fuzzy brown pony who had the run of a vast farm. "One sunny morning, nice old Farmer Hayrick came out into the meadow. 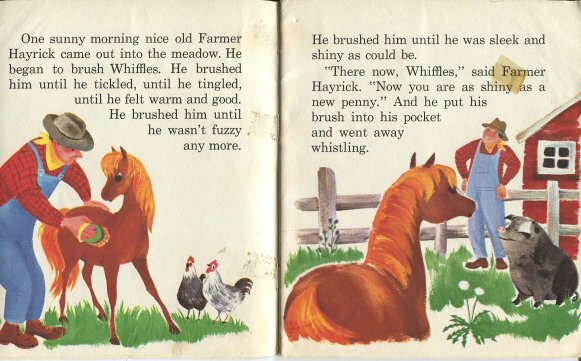 He began to brush Whiffles. He brushed him until he tickled, until he tingled, until he felt warm and good. He brushed him until he wasn't fuzzy anymore." "There now, Whiffles, " said Farmer Hayrick. "Now you are as shiny as a new penny." 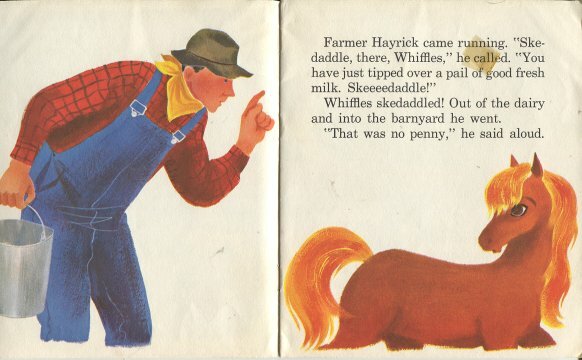 Whiffles, being a pony, had no notion of what a penny looked like and so went to ask his friend Old Dapple Dobbs. "A penny," he said, "is very shiny. And sometimes it can make a tinkly ringing noise. I saw one once." "A penny must be a fine thing," decided Whiffles. "I will look for one." And he headed out to find a penny. He encounters a shiny pail of milk in the barn and as it fits the description, he investigates and only succeeds in tipping over the pail, incurring a scolding from Farmer Hayrick. 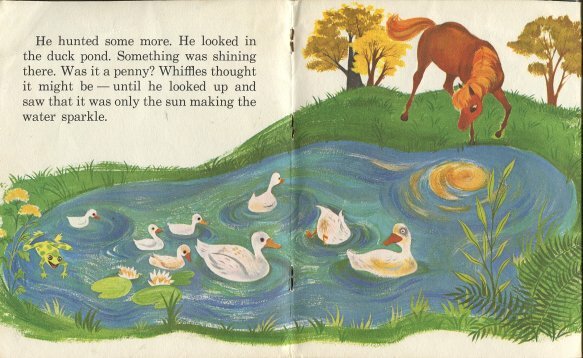 Mr. Buttons, the goat informs Whiffles that not only is a penny shiny, it is also round, like the full moon. And it is that same beautiful sort-of-orange color. 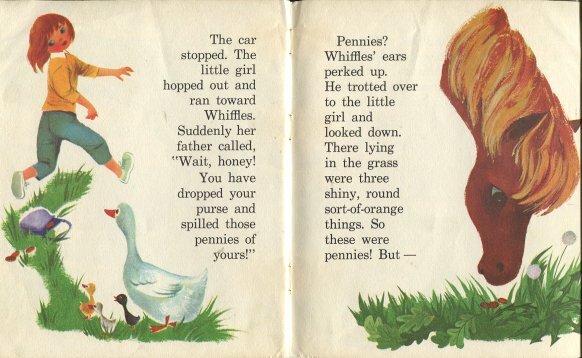 "Oh," said Whiffles, "a penny must be the most beautiful thing in the whole world. And I would like to have one." 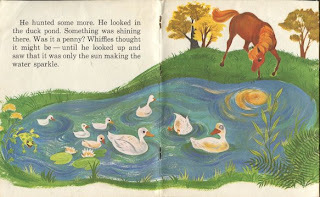 He continues his search around the farm and comes upon the duck pond, in which something was shining. It was only the sun making the water sparkle. Whiffles looked in the tractor shed, in the apple orchard, and in the hayfield. And then in the cornfield, he saw a thing lying on the ground. it was round. It was shiny. It was orange. "A penny!" thought Whiffles, touching the thing with his nose. But then Farmer Hayrick came hurrying. "Skedaddle there, Whiffles," he called. "Don't you touch that big, round, ready-to-pick pumpkin!" As Whiffles was about to give up, around the curve came a motor car. A little girl leaned out the window to get a better look at Whiffles. The car stopped. The little girl hopped out and ran toward Whiffles. Suddenly her father called, "Wait, honey! You have dropped your purse and spilled those pennies of yours!" Whiffles ears perked up. He trotted over to the little girl and looked down. There lying in the grass were three shiny, round sort-of-orange things. So these were pennies! Whiffles' head drooped. His ears drooped. Sadly he turned away. "Pennies are nice," he said to himself. "But they aren't as nice or as pretty as I thought they would be. They are not the most beautiful things in the whole world." Suddenly Whiffles heard the girl's father say something. "Penny," he said, "you must be more careful, or you will lose those pennies." The little girl laughed. "I'll be more careful, Daddy," she promised. Whiffles blinked. Was the little girl a penny, too? That was what her father called her. Whiffles looked carefully at this Penny. Her hair was the color of a big sort-of-orange moon. Her eyes were as shiny as the sky on a sunny summer day. And best of all, when she laughed it was the tinkliest most ringing kind of laught Whiffles had ever heard. Now that, thought Whiffles, is exactly the kind of penny I would like for my very own! He went up to the little girl and rubbed against her arm. The little girl put her arms around Whiffles and hugged him. "Oh Daddy," she said, "this is exactly the kind of pony I would like for my very own!" Such a delightful spot! I hope you post more and more! Thank you for posting this! All I could remember from the story was something about Penny and Farmer Hayrick. When I searched for Farmer Hayrick, your blog came up. I will now be able to find this on ebay to get it. Yay! I'm so happy to have bridged the gap of your memory. I have been looking for this book for ages! All I remembered was a copper-coloured pony and golden ball of sun. I can't believe it! First I found the book on E-bay, but to see the actual pages? I'm in childhood heaven once more. Thanks so much! I am so, so delighted to find this story!!! I remember buying it at the grocery store with my own money as a very young girl. I bet it cost a quarter. I could not remember the name these fifty years, but knew it was about a girl with penny-colored hair, and a penny-colored pony.And I remembered I loved the story. 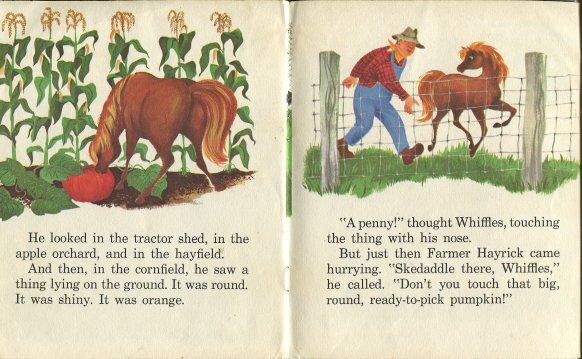 So I googled "children's book Penny and a penny-colored horse" and found you! Thank you so much!!!! I, too, have fond memories of reading, rereading, re-rereading... this very favorite book from my childhood. I had a copy at home and at Grammie's camp-where we spent summmers-so I ALWAYS had it with me. Over the years, I have looked for it, but could only remember a copper colored pony 'named' penny. Today I finally stumbled onto your blog. Thank-you so much! It was pretty awesome to reminisce as I re-re-re-re.... read this beloved book. Some childhood books are just beyond amazing. i have a few till now and I haven't had the heart to throw them away.My children will read them. This was one of my very favorite books in childhood, and now my copy is on our granddaughter's bookshelf. I have a dear friend who looks very much like Penny, so was looking for a copy to give to her and only found one much more expensive than the one purchased for me. Thank you for posting this beloved and sweet story. RTE Admission 2019 This is so awesome. this was my favorite book.I haven't had the heart to throw them away.My children will read them. CBSE Result 2019 I am so, so delighted to find this story!!! I remember buying it at the grocery store with my own money as a very young girl. This was my favorite book as a child. I am 59 years old. Have been looking for it for years. All I could remember was a copper colored horse named Penny. My daughter found this and sent it to me. I loved reading it once again. Still love it. Thanks for letting me relive my childhood once again! !